Classic amp distortion has seen a revival over the last couple of years. That creamy, slightly compressed tone is incredibly versatile and the pedals fits almost any amp and setup. The V-2 from Vick Audio promise to capture the tone and power of a large tube stack. Hereâ€™s my review. As you might have guessed, or already read in other reviews, the V-2 is based on the Pete Cornish G2, which David Gilmour used extensively in 2005-06. The G2 is in turn similar to a Big Muff, with some of the sonic qualities of a RAT. The Rat has always been one of my favourite pedals and a go-to unit for recording. The G2 utilised everything that was great about the RAT, gave it a bit more of everything and took it closer to the tone you get when plugging into the front end of a hot Marshall or similar. Big Muffs and moody fuzz pedals are great but thereâ€™s something about that timeless sound of a cranked tube amp thatâ€™s hard to beat. The V-2 isnâ€™t actually a G2 clone. In fact, Vick Audio decided to use silicon diodes instead of germanium transistors, which gives the pedal a unique tone of its own. The V-2 is really something different – in all positive ways! â€¨â€¨The V-2 is housed in a sparkling metallic T-Rex sized chassis, with controls for volume, tone and sustain. It features true bypass switching (buffer engaged when activated) and it runs on 9V Boss-style adapter (no battery). The first thing you notice is that this is indeed something different. Itâ€™s got much of the creamy saturation and sustain of the G2 but itâ€™s much more open sounding, with more low end and a crispy top. In fact, it sounds like a mixture between an early 90s Sovtek and the G2. Thereâ€™s definitely a amp-like character to it but also a lot of that raw and edgy Big Muff tone. It says in the description of the pedal that itâ€™s got plenty of headroom but unless theyâ€™re referring to the huge amount of distortion you can dial in, without getting any nasty overtones, itâ€™s a bit misleading. Thereâ€™s no clean tone anywhere. But, this is a distortion pedal and whether you got low output single coils or hot humbuckers, the V-2 will provide a full bodied tone no matter what. With the volume dialled above unity gain, you get that smoothness and mild compression, similar to a hard driven tube amp. With the volume backed down a hair and the gain almost full up, you get some wonderful harmonics similar to a Big Muff and silicon fuzz. The tone control responds very well, with a wide sweep, from dark rhythm tones to crispy fuzz. Unlike the G2, which can sound pretty fizzy and thin, with the tone set high, the V-2 stays warm and musical. The gain stage also seems to be more linear, maintaining much of the tone at extreme settings. Another huge plus is the low noise level. Even at high volume and gain settings, the V-2 stays impressively quiet and focused. You canâ€™t really compare this to a G2, or even the many clones like the Buffalo FX Evolution and Toptone DG2. As already mentioned, itâ€™s more like a Big Muff but with that amp-like quality to it. 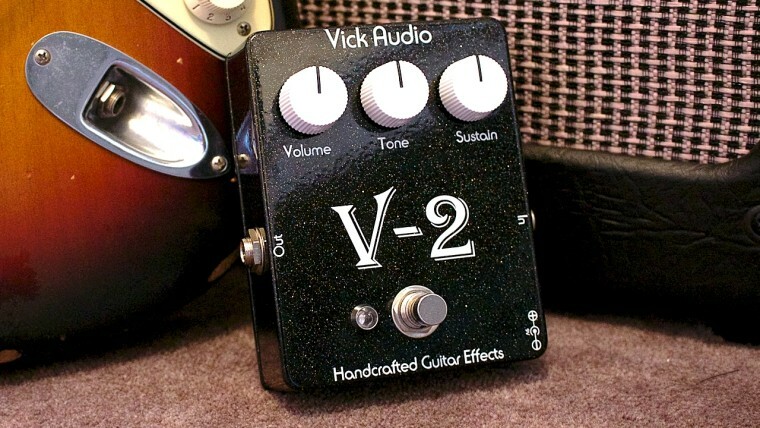 Whereas most distortions tend to lose much of their character on typical bedroom setups and low volume, the V-2 can handle pretty much anything, making a excellent alternative for many other high gain pedals out there. I also found it very easy to record, with that slight mids boost and fat lows helping out. The V-2 is a cool sounding distortion, with some unique qualities that I havenâ€™t heard in any other pedal. Highly recommended if youâ€™re looking for that classic British tube amp tone, with a twist! Check out vickaudio.com for more details. Bjorn; I have the BYOC triangle, and a Fulltone OCD v7, SSL 5 bridge. Playing through a Orange CR60 amp. It has a classic British character. A bit on the darker side of things. My question is does this V2 sound anything like either of those pedals? I am looking for another flavor of muff (lol) but don’t want to have redundant pedals. I really do love the triangle with electric mistress for Animals/wall/final cut tones. They are my fav. My second would be 2006/Gdansk. David’s rig sounded tight and focused, and when I saw Echoes live it totally blew my mind. So from what I heard this pedal will get me pretty close. How’s the harmonics on this pedal? I am a huge fan of pinch harmonics when playing some Gilmour. Also have you mixed this pedal with a mistress? I would go for the Evolution if funds permitted, but the V2 seems like a nice alternative. As always thanks for saving us all a lot of time and money by dedicating yourself to this wonderful website. The V2 is very close to the Evolution and Cornish G2 but perhaps a tad closer to a Muff, with more grit and a slightly more open character. I think it makes a fine addition to what you already have but it depends on how distintcly different tones you need. Thannks, Bjorn. It seems like the V2 sounds a bit like the muff boosted with a tube driver, if I’m hearing the youtube vids correctly. A Bk tube driver would be out for me because I am pretty sure it wouldn’t go well with my amp. And I really take what you say about the best pedals for my particular setup seriously. I can build the best, and most expensive pedal board ever, but if I don’t have David’s setup, or yours, it’s just not going to sound the same. I just wish I could try them before I buy on the internet. V2 sounds like an awesome pedal if Gdansk bare – bones tones are what I am going for. Good approach. The V2 seems to be easier to set up compared to a Muff and TD as it has more mid range and compression. Nice. One more question; to compress, or not to compress? I’d be running an Orange kongpressor with it. It’s an “always on” pwdal. But if the V2 has enough of its own, It wouldn’t make m uch sense to over compress it. And do you usually run a compressor at home? Depends on the total amount of compression in your chain, including the pickups, tubes and speakers. There’s no harm in adding a bit of compression to high gain pedals but you don’t want to overdo it as it can take away much of the dynamics of the tone. Many sellers on Reverb offer 7 to 14 day money back guarantee’s, less the shipping. That gives you the opportunity to try it out for just the shipping cost. Not that you want to make a habit of returning gear, but if you just really don’t like the sound you can. Just a thought since you mentioned wanting to try it out! Thanks Bjorn. I guess I can experiment. After all that is pretty much just as much fun as playing right? It can also make you obsessed lol. And thank you Chad. I forgot reverb did that. I guess I wish the guitar center by me had the Vick pedals so I can try it no hassle. Got the V-2 today. I’m impressed. Harmonics city! You can’t get a bad sound out of this thing. Whereas a muff can be very finicky, the V-2 sounds very tight. I would recommend it to anyone wishing to buy it. Very smooth. Hi Bjorn! Quick question (more to gauge the tonality of the pedal): in 1 or 2 of the clips in the vid above (think I’m thinking about the On The Turning Away clip) you can see the bridge pickup is engaged. My question is, do you have the switch on engaging the neck pickup as well? Trying to work out whether the throatiness of the pedal is solely from the pedal, or whether the neck pup is helping add to that as well. That’s just the bridge pickup. I don’t have a switch like David that combines the neck and bridge. hi bjorn cool review !! and one more question ! the second solo in the review , whats the name of track ?! The Ram’s Head is, as the name implies, based on the early 70s Ram’s Head Big Muff, which has a fairly bright tone, less mid range and more of a fuzz character. The V2 is based on the Pete Cornish G2 pedal David used in 2005-06, which again is based on a Big Muff circuit but tweaked for more of a tube amp distortion kind of thing, with more mid range and compression. Kind of a Muff meets a Rat. Which you should choose depends on your amp but for bedroom use, you’re probably better off with the V2. Hi BjÃ¶rn. I ordered a v2 because of your nice review. Got my v2 today. Great Sound. I put it after my dynacomp and it seems like the v2 has a Problem with it. When I turn on the dyna, there is a Volume drop. Any ideas? My amp is a laney cub 12r. Keep in mind that a compressor will always react to the given signal and depending on what you feed it, you might experience a volume drop. That’s the nature of the compressor. The volume control on a compressor pedal is a so-called “make up gain”, meaning that it should always be set to either compensate or boost the given signal. The reason you experience a drop, is because the pedal is compressing a lot. Decrease the compression or increase the volume. Hi Bjorn, I own the Ram’s Head of Audio Vick. Is there a big difference from the V2. The Vick is brighter, has low end and a scooped mid range… although you got the mids boost feature. The V2 is darker, more low end and more mids. Wanted this pedal the moment I started hearing it in your demo! Turned up under the Christmas tree this year, and I’ve been having immense fun with it ever since. Works very well with lap steel too, added sustain really brings out the very highest notes ringing like a bell compared to how quickly they usually die out. Almost as gritty as a DA Fuzz, but the saturated smoothness of a Big Muff, a perfect combination! Hi Bjorn, love the reviews and advice you give here! Just looking your opinion, I have a Buffalo fx Evolution, and am looking to add something else to compliment it. I feel the Evo works great at lower and higher gain settings. So am thinking of a TD-X to cover lower, dynamic sounds, and the Evo for more gainy leads. Or keep the Evo for lower gain and go for a V2 for higher gain, or even a Patriot, though that might be too much!? The V2 might cover the big sound but offer more variation over a muff? Based on your review I decided to give the Arc Effects Soothsayer a try. I have an American Strat with 50’s, 69 and SSL bridge and play through a Mesa Boogie Rectoverb 50w combo. I tried for a while with a few different amps and od’s combined to get Gilmour tones out of my BYOC Triangular, but never could get there. The Soothsayer however has hit a home run for me. I run a Wampler Euphoria behind it and the sound is fantastic. Quite honestly, I should be more than content with my recent tone dial in, but after hearing your review….now I am curious about the V2. So how would you compare the V2 with the Soothsayer? As usual…let me thank you for your site and the info. Just FYI, still playing plenty of Airbag to my friends! I will put it on in the background while we are hanging out and it never fails that they ask me….what is that?! They always love it! Thanks a lot for your support, Chad! The Soothsayer has much more mid range, more gain and slightly less low end. The V2 is more of a Big Muff, with less mids – although more so than most Big Muffs – more low end and an overall more aggressive sound. They’re not two entirely different pedals but I would perhaps hold the Soothsayer as more versatile. Bjorn, the blinks are there I just couldn’t see them from the angle I was looking at it from. Hey Bjorn, sorry about this being off topic but weird things are going on with your Echosex 2 page. What power supply do you use with your Echosex 2. The sound on sound review suggested that it is finicky. Any thoughts? Will a Pedal Power 2 be ok with it? I’ve just used a line from my TRex Fuel Tank. Seems to work nicely. No daisy chain though… it adds noise. I’m not sure what you mean by no daisy chain. I also noticed that the light around the tube in mine does not blink. I’m using a TC Helicon 12V from my Nova to power mine. *sign* The agony of choice… I’ve been thinking either getting The Patriot or Evolution to go as my main “all-out-lead tones” device (with all the possible thoughts and arguments of why the other one is better choice than the other) This one seems to have that smooth singing muff-like quality to it while being more versatile thanks to it amp-like feel. And like always, your personal opinion and thoughts are more than welcome Bjorn. You think it would work in a combo with Deluxe Mistress and DD-2 for those The Wall-present type of tones while also covering the ground of Pompeii and Dark Side with RE-20 Space Echo? Thank you! Hi Julius! I guess the Evolution is a more versatile pedal, capable of covering a wider range of tones. The Patriot is great, one of my favourite Muffs, but it is a Muff and that tone is perhaps a bit limiting if you want to cover it all. You know a guitar pedal is really good when your wife is jealous of it. Do you have played any guitar having GraphTech nuts installed on it? A local luthier pointed me that it can hugely improve tones and sustain, more than a bone nut would. I have that one a couple of my guitars but for some reason I’ve always preferred bone for my Strats and Teles. I don’t notice a huge difference but obviously, it also depends on the guitar. Depends on the amp. The Musket has much less low end but otherwise they’re fairly similar. I guess the V2 goes better with brighter amps and the Musket on darker… but again, they’re very similar. You should make a review of the Boss HM-2. Use it with a Boss GE-7 and have tons of tones! I’ve been in a pulse mood here lately. This would seem to work really well for that era. Or on an island. Do you find this versatile enough to use for other genres too? Btw, listening to pulse bootlegs, David’s doppolas seem to be more noticeable than on the pulse Dvd and recording. Why is that? When they edited the audio was the doppolas somehow mixed lower? Anyways great review as always! Great playing as well! The rotaries are very low on both Division Bell and Pulse. I don’t know why but it’s about taste I guess. You’d hear if they weren’t there but compare Division Bell with Endless River or, as you say, Pulse with a bootleg from that tour and you’ll hear how dominating they really were. My favourite bootleg from the ’94 tour, and the best one to really hear the Doppolas, is the Modena, Italy show. Yes I agree about the Modena show. There’s a hey you bootleg and it sounds better, to me, than the version that was released on the PULSE cd simply because of how much louder the doppolas are. To me, it’s similar to how loud his yamahas were on “Is there anybody out there”. Cheers! Where is the Hey You from? I have the TV version of the PULSE DVD, which was a live broadcast I think. It’s unpolished and you can hear lots of mistakes but David’s guitars sounds so much better than on the final CD and DVD. Here’s a link to the one I’m referring to. The footage seems to be different from the audio. But sounds great to me. How would I be able to hear the live broadcast version you have? The Cornish G2 is based on a big muff, completely different circuit to a RAT about 3 times as many parts, transistors not opamp gain stages. The RAT has silicon diodes shunted to ground for harder clipping, the G2 has soft clipping with a mix of silicon and germanium. The Evo has the same 2 clipping stages as the G2 but other than that the circuit is different, only the middle 40% has the same topology (big muff) although the values are different. The Evo uses 3 x transistors & 1 x opamp. G2 uses 5 transistors inc buffer. RAT 1 opamp and 1 transistor. Completely different circuits. Thanks for the input Steve! Of course, you’re absolutely right. I was referring to the sonic qualities and similarities but ventured into some technical stuff that isn’t my strongest side. Thanks! I’m also glad seeing you play ‘On the Turning Away’, it’s definitely one of my favourite Gilmour songs (music and lyric-wise) and solo sound. One specific question: Did you play with the tone knob on the guitar at all in these recordings? And if so, how does it respond? Thanks in general for all the effort you make in all this, greetings from a weekly lurker! Since Castledine electronics has added his V2 Muff clone to his stable of stock pedals, I have to wonder why they chose to use that name? Although I’m not sure, I would think Stu would have registered the name of one of his stock pedals. And still wish you’d get your hands on one to try. There are no clips online that do the pedal any justice at all, and I’ve yet tonhear a better sounding Violet Ram’s Head clone. I think you’d say the same were you to ever play through the Castledine V2. Doesn’t appear to be any rights to the V-2 name (did a quick brand register search). Anyway, V2 is a fairly common way of describing a “version 2” of something and although I’m not not sure why Vick used that name, I can guess that it’s a spin on the fact that it is a slightly different version of the G2. Always a bit unfortunate when products are called the same but I don’t think it was intentional in this case. Besides, the pedal sounds very different from a ram’s head. i agree it wasn’t intentional, but am a bit surprised Stu didn’t register the name, although It do understand that V2, or V followed by any # sualky refers to a version #. I guess I wanted to remind people that there’s another V2 that they should look into! Everything Castledine makes is magic! His wah is the most vintage sounding wah I’ve played, and while it usually takes many hours to dial a new Muff into that Sweet spot, the V2 took me about a minute! So, there’s my Love for Stu’s gear post, and I guess to be predictable, check out Lindy Fralin pickups. The greatest Fender pup winder on Earth!! You should get a cut from both, ha ha! I wish!! I also wish I could get Lindy to get you those pickups. I know he just forgot,( he’s one of those guys so into what he’s doing, he’ll be late for his funeral because he’ll forget he died! As far as the V2 goes, I can only say that I know it would be one of your favorite Muffs, and would likely end up on your board. If I ever ger time to stop by the shop, I’ll refresh Lindy’s memory, but haven’t been to the shop in a year or more! I don’t know why this posts replies only come out in two word lines? Any idea? It’s my phone! Every time I reply in the same post, the post box gets smaller! It’s now so small that your last reply came out as one letter over the next, but I was able to decipher it. Very strange? Hahaha!! No problem on my iPhone but I’ve gotten that from others as well. The WordPress template that I’m using might not be ideal for looking at the site on a phone. I’ll look into it when I get the time. Nice review Bjorn!! Time sounded really good man! I’ve owned the G-2 twice. It’s just way to noisy and I do not like using noise suppressors. I’ve owned the DG-2 and liked it more than the G-2. The Buffalo Fx Evolution is a thing of beauty really. Do you find it different enough from the V-2 to warrant having both? The V-2 has an attractive price to. I’m sitting at home purging crap from the apartment and my phone buzzes that you’d uploaded the video to youtube and thought “I bet Bjorn just put up the review” and sure enough! Haha. FANTASTIC playing on that demo Bjorn! Probably some of the best playing yet. I’m also really happy to see you do more songs from David’s more recent career (as opposed to 70’s) although I do love the early stuff. That pedal sounds REALLY good. Almost like the Skreddy P19 in that it sounds good by itself and VERY close to what inspired it. After your suggestion on the Vick Muff, I have REALLY come to dig the stuff Mike puts out. He’s got a good ear for tone and uniqueness while still honoring the classics and what inspire us guitarists. ALSO! I gotta say, I’m really loving the Lionheart tone. That thing is sounding REALLY good! !